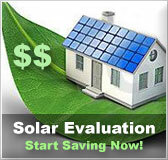 California residential solar energy incentives | Solar Panels | Solar Power | Site Map | Bookmark This Site! CSI is a state rebate program designed to allocate $3.2 billion over 10 years. 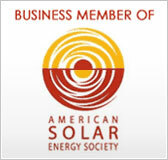 Eligible solar systems include solar space heating, solar thermal electric, and photovoltaics. There are two ways to take advantage of the rebates: Expected Performance Based Buy-Down (EPBB) is for systems with less than a 50kW capacity. 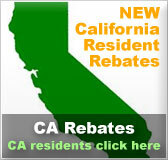 The up-front, one-time rebate begins at $2.50/W-AC but will decrease the closer California gets to its goal of 3000MW. Performance Based Incentives (PBI) are for systems of 50 kW or larger. These rebates are paid on a monthly basis and depend on that month's performance. Smaller systems (<50kW) can opt for the PBI option but larger systems cannot choose the EPBB. Performance based incentives also decline over the span of the 10 years. Rebates are also available for non-PV solar technologies, which produce or displace electricity, such as Thermal, Space heating/cooling. However, solar hot water heaters are excluded. Two Important Notes: The California Solar Initiative is administered by the CPUC, therefore, eligible homes must be existing, grid-tied homes. New homes fall under the jurisdiction of the California Energy Commission (CEC) and the New Solar Homes Partnership. Equipment used must be installed by a licensed contractor and meet eligibility requirements, including being grid-connected and warranty specifications. The NSHP is a set of tax rebates ($400 million over 10 years) geared toward California's builders and new construction. It covers Photovoltaics only and targets single-family, multi-family, and low-income residential construction. Incentive amounts vary based on the type of housing and expected system performance. NSHP homes must be at least 15% more energy efficient than current building standards although builders are encouraged to reach 35% above average efficiency. System size: Minimum: 1 kW AC Maximum: 100% of the home's expected electricity needs. Systems must be grid-connected and either self-installed or installed by a contractor licensed in California. San Diego area rebate program for customers of the San Diego Gas and Electric Company. The maximum incentive for residential customers is $1500 and is based on expected performance. The system must be retrofit for an existing consumer. Specific licenses are required for installers. Note: Self-installers need not be licensed but must attend a one-day training workshop. Pool/Spa heating systems are NOT covered under the rebate program. Rebates are paid to contractors to be passed on to the consumer. Rebates are directly paid to owners of self-installed systems. Feed-in tariff includes both solar thermal electric and photovoltaics. Prices are based on the CPUC market price and adjusted by time of use with higher rates being paid out during hours of peak demand (8am-6pm). Customers may enter 10, 15, or 20 year contracts. Maximum system size is 1.5 mW. Any customer who participates in the feed-in tariff is unable to participate in any other state incentive. In addition to the CSI, other utility rebate programs are available throughout the state of California, provided by municipal utility companies. Information and details on all the different programs are available on the internet. Details and requirements for each program will vary. 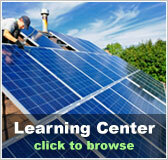 Rebate programs are generally available for customers who install solar photovoltaic systems. Rebate amounts are typically determined by a per-watt AC basis and depending on the system’s size and applicable sector. This federal personal tax credit allows the taxpayer to claim a credit of 30% of expenditures including labor costs and installation of qualified residential solar-electric systems, solar water heating systems or fuel cells. Small wind-energy systems and geothermal heat pumps can also be accredited for. Solar-electric systems and solar water heaters have a maximum incentive of $2,000 if placed in service before 2009. There is no maximum incentive for systems placed after 2008. The excess amount of the federal tax credit may be carried forward to the next taxable year if it exceeds tax liability. This can be carried forward until 2016, but after that, it is unknown if the unused credit will be able to be forwarded. This is a personal exemption of 100% of energy conservation subsidies provided by public utilities. The value of a purchase or installation of any energy conservation measure by a customer such as solar water heat, solar space heat or photovoltaics will not be included in the customer’s gross income. Customers of an electric utility company, who participate in the utility’s energy conservation program, may receive a rate reduction of electricity furnished or a nonrefundable credit against the purchase price of the electricity on each monthly electric bill.